Pre-drawn Express-G symbols represent entity, enumerate type, select type, boundary, pointer, cardinality, inverse cardinality, etc. These symbols help create accurate diagrams and documentation. Express-G templates provides you lot of special shapes, entity, enumerate type, select type, boundary, pointer, cardinality, inverse cardinality, normal relationship, etc. You will surely find these shapes very helpful when drawing the express-G diagrams. Entity in a database could be a single person, place, or thing about which data can be stored. Defined type is the most important datatype in Express-G. Select type defines a choice or an alternative between different options. Most commonly used are selects between different entity types. Tree structure is a structure in which there are successive branchings or subdivisions. 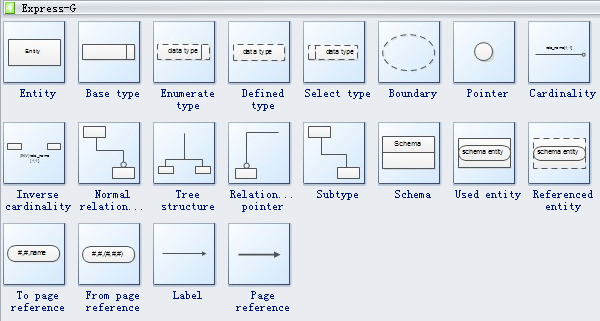 Schema is a way to logically group objects such as tables, views, stored procedures, etc. Page reference is a reference to an instantiation of a page. 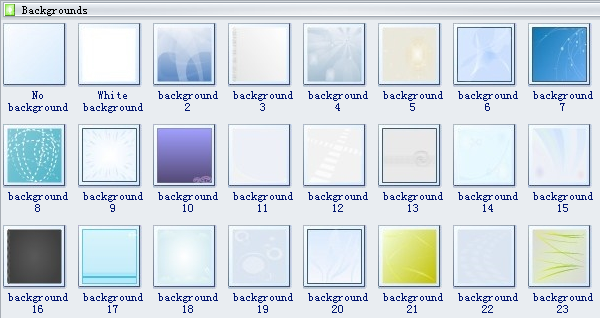 Various kinds of backgrounds are available here in Edraw software, and they will surely make your diagrams more attractive. Need fresh looking Express-G symbols for your design? These Express-G symbols are a cinch to pop in. And their crisp, fine detail will make spectacular, easy-to-understand diagrams and presentations to your customers.